This is the fourth CD in Leo Records catalogue by The Aardvark Jazz Orchestra led by the composer, arranger, conductor and trumpeter Mark Harvey. 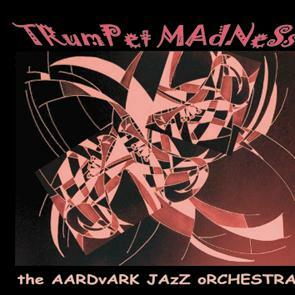 Trumpet Madness displays the unique and disparate sounds of several wonderful trumpeters woven into the fabric of multi-stylistic orchestral compositions. Recorded in live performance, these compositions present the band's commitment to spontaneous creation within complex structures. Mark Harvey's approach to blending the solo, collective, and conducted improvisation of 28 talented players has been developed to a high level of intuitive and expressive virtuosity.